"And you may, O my brothers, have forgotten what these mestos were like..."
Signage in a BorneLund visited not long ago. 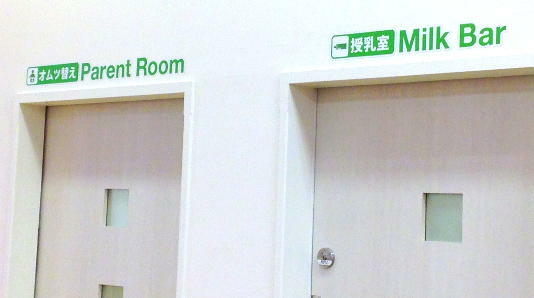 The room on the left is for changing diapers. The one on the right is for bottle- and breastfeeding. I'm about 85% sure that the joke is intentional. I just realized that Séraphin Couvreur's 19th-century double traduction of the Classic of Poetry 詩經 into French and Latin is available in its entirety at archive.org: Cheu king: texte chinois avec une double traduction en français et en latin. He even included the original Chinese text! On the island in the river. So shall be the prince's fere." Les ts'iu kiou (se répondant l'un à l'autre, crient) kouan kouan sur un ilot dans la rivière. Une fille vertueuse (T'ai Seu) qui vivait retirée et cachée (dans la maison maternelle), devient la digne compagne d'un prince sage (Wenn wang). Le 雎鳩 ts'iū kiōu est un oiseau aquatique. Il ressemble à la mouette ou au petit canard appelé 鳧 fôu. Il est le symbole de la fidélité conjugale. Plusieurs anciens auteurs prétendent que c'est une espèce d'aigle de mer. T'ai Seu, c.-à-d. l'auguste Seu, était fille du prince de 莘 Chēnn, dont la famille se nommait Seu. (Invicem respondentes) kouan kouan (aves aquatiles) ts'iu kiou sunt in fluminis insula. Segregata, abdita, optima puella (facta est) principis sapientis eximia conjux. As usual, the more translations are compared, the more apparent it becomes that I should have just read some poetry by Ezra Pound instead. Say what you will about his accuracy: "hid, hid!" is definitely the best thing in any of these renderings. I suppose he somehow tortured it out of the "barred door, lock, guarded pass" meaning of 關, even though it's just used for sound here, as Couvreur recognizes. Baxter (1992) reconstructs this osprey-quack as *kron in Old Chinese, incidentally, giving Middle Chinese kwæn (or kwan in Karlgren's reconstruction). Special bonus: Anquetil-Duperron's 1804 translation of some Upanishads into Latin ("OUPNEK'HAT (ID EST, SECRETUM TEGENDUM): OPUS IPSA IN INDIA RARISSIMUM"). All I have today is this amazing 1937 recording of the tungso (洞簫) tune "Bongjangchui" (鳳將雛? 鳳雀吹?) by Yu Dongcho (1881-1946, mentioned here). Hearing the title Suki tte iina yo repeated about a jillion times over a convenience store PA the other day, I got to thinking about the official English translation of the title: Say "I love you." This is grammatical, and captures the outlines of the original at least, but it strikes me as unnatural. Please don't say, "You are lazy,"
Here, too, I think that the natural English sentence would be "Please don't say I'm lazy," or, better, "Please don't call me lazy." Looking it up now, the title of the song is actually Don't say "lazy" , which I strongly suspect is a rendering of an original something like lazy to iwanaide, more naturally Englished as "Don't call me lazy." Indirectness! Why this difference between the two languages? Ultimately I think it comes down to the fact that (spoken) Japanese doesn't distinguish between direct and indirect quotations in the same way as English. The most natural translation of Iranai to iimashita would probably be something like "She said [that] she didn't need it," but structurally speaking a rendering like "She said 'I don't need it'" is just as valid. Japanese simply does not have the relevant pronoun-usage rules or verb morphology to make this sort of thing clear, and it uses to either way (rather than making an optional distinction with a subordinating conjunction like English). This being the case, it makes sense that native Japanese speakers looking to translate this construction into English would go for the simpler of the two equivalents, i.e. direct quotation. I guess it's basically equivalent to the way native English speakers tend to underuse passive constructions when they first start learning Japanese — the active versions of the sentence aren't grammatically wrong, and since they more closely match the structure of the English they come to mind more readily. A Sprachgefühl thing. Here's an interesting tale of word creation. It begins with kaminaga 髪長, literally "long-hair". This word was invented sometime in the first millennium C.E. as a substitute for words meaning "monk", which were taboo at certain times and places (the new year, Saikū, Ise Jingū, etc.). It was invented early enough to undergo sound change and be attested later as kōnaga as well, but this did not become the standard, presumably because its morphology was so transparent and easily reconstructible from kami "hair" and naga "long", the former of which did not become kō as an independent word. There are seven euphemisms [in this category]. Buddha is called "guy in the middle" [of the temple, I guess] (中子) . Sutras are called "dyed paper" (染紙). Stupas are called "wild onions" [or some kind of plant] (阿良良岐). Temples are called "tile-roofs" (瓦葺). Monks are called "longhairs", and nuns are called "woman-longhairs". Food [eaten in accordance with monastic regulations] is called "half-servings" [because monks weren't supposed to eat after noon] (片膳). So far, so good: an ironic euphemism for the practitioners of a foreign religion. But kaminaga is a simple combination of common morphemes, so of course the word was going to get reinvented. As it turns out, by the Edo period it had been reinvented twice, with the meanings "woman" and "layman" — as opposed to monk. Eventually it began to be used just to refer to long hair and the long-haired in general. So by the early 20th century, the word kaminaga could be used either as an ironic reference to baldness or a non-ironic reference to having hair. In the latter case, it could refer to anyone, male or female, who had long hair, short hair, or even no hair at all provided that they were not prohibited by their religion from growing it.